It's lovely to see you! I've missed everyone! I want to thank you very much for your well wishes, prayers, and all the cards that are pouring in! My surgery went well and my recovery is going smoothly, although we have had some unexpected stress which I will tell you about below. Hmmm, what stamp or die is the same on both cards? What is the prompt? This die does three things, or possibly four or five. It cuts a slit and circle in the paper, or if the paper is shorter than the die, it cuts the paper in two with half-circles on either side. From that you can extract a double-line border around a circle, with a small circle cut-out. You can also put the frame back together like I did for my Sending Hugs card or even insert the entire cut-out back into the opening for a cool design feature. In other worms, it's very Versa Tile. For my onefer, I cut the antennas off the circle frame, spread the legs, and made myself a chickadee Santa to join Technique Tuesday's "Chickadees" stamp set! The Santa hat (from the Tim Holtz "Bird Crazy" accessory set) is made from fun foam, and the sediment is from Paper Inspirations. Hammy drew on the feet and the face and regaled me with his imaginings of the conversation Santa is having with Mama Chickadee. You'll enjoy making up your own story about what's going on in this picture and the conversation they are having! I know I shouldn't generalize, but don't the artist's images on the left look like your typical curious 3-year-old, clueless 10-year-old, and dazed dad in between?! For my twofer, I cut the circle border frame from blue fun foam and left it as one piece. The front panel has a narrow blue matching paper mat and I added an interesting geometric Washi tape border. The pretty die-cut sediment is from PTI. I couldn't believe my luck when the beautiful blue butterfly landed on the circle just as I was taking the photo! I'm lying, but it could've done. And that's it, an EZPZ QACAS TWOFER to inspire you!! I'm sure you don't even realize how many geometric stamps and dies you belong to until you start looking around! 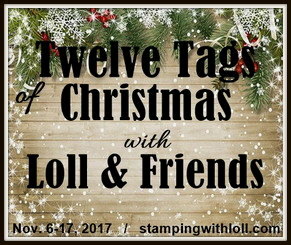 I hope you are intrigued and able to play along this month! 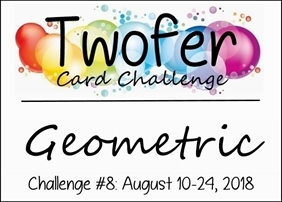 For a chart of geometric shapes and an array of sensational cards from Cheryl and Brenda, our two talented Guest Designers, and from the entire DT, please click over to the Twofer Card Challenge. Mwah! Adam, of the famous Adam and Henry grandtwins, had a shallow dive accident while away at adventure camp last week. 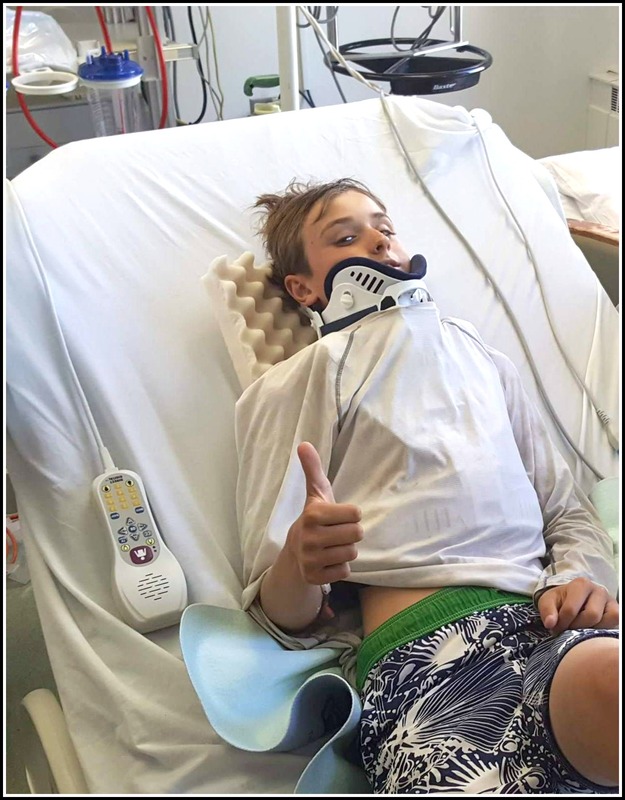 He hit his head on a jagged rock, sustaining a large gash, a concussion, and three cervical and thoracic bone fractures. Fortunately, he was able to be transported two hours away to Seattle where he could receive excellent imaging and care. He has to wear the neck/chest brace for six weeks in the hopes that the scary cervical break can grow back together, which will avoid major neck surgery. He starts 8th grade next week. He's being a real trooper about the situation and he learned a valuable life lesson. We are beyond grateful that his injuries weren't more severe and permanent, as is often the case with diving head injuries, but he's not out of the woods yet. I wanted to share because the more prayers and positive thoughts that can be sent to Adam and his parents, the better. Thank you! This has been a rough medical year for our little family. On the plus side, Henry stayed at camp and had a fantastic time! Please remind your kids and grandkids that before they dive, they should always walk into the lake and swim below the water in the area where they are planning to dive to make sure it is deep enough and there are no big rocks. Better to be safe than sorry! Fabulous cards Darnell and a great way to use your die. I do hope Adam makes a quick recovery from his accident. Good to hear you are on the mend Darnell but very sad to see what has happened to your Adam. He is a very Lucky boy and i'm sure there are a few life lessons learnt from his experience. Sending well wishes for a speedy and uncomplicated recovery. When we see, hear and read things like this it really does put own own lives into perspective. Beautiful CAS cards, I love those frame dies the funky foam cuts add great dimension. Hugs & well wishes to you both. Heavens to Betsy! Seems I'm only away a couple of weeks and somethings happen. I will definitely add Adam to my prayer list... special prayers required there methinks. Glad to hear you're getting better and that's two great cards there...really got me looking!!! My goodness what a lucky young man Adam is that this serious injury wasn't even more serious. I do hope he recovers well and speedily and as you say, he will have learned to be more careful next time. Pleased to hear that your surgery went well Darnell and that you are recovering well, just keep taking things easy. Two fabulous cards Darnell. I'm glad everything went well for you but so sorry to read about Adam and his terrible injury, of course I will be sending good thoughts and prayers his way in the hopes for a fast recovery. Oh my, he was a lucky boy! Bigs hugs(not too hard) for a speedy recovery with no lasting effects. Oh Darnell what a scare - that was one potentially nasty injury!! So glad Adam is recovering well thus far, and you too! Love your cards, and I had to look twice to see what/how you had used the same element on the cards - well done, that birdy one is a fabulous!! So glad Hammy could help you with the features and feet, and entertain you with some distracting stories. What a God whisper! hugs to all of you! I'm very glad you're on the road to recovery, Darnell! But how scary Adam's accident was! What an anxious time for you all - but he is having excellent care and will be up and about again before you know it! Sending you, Adam and all the family love and healing prayers. And your CAS cards are gorgeous! Oh Darnell, you and your family seem to be really going through the mill this year. I hope he makes a rapid recovery - he looks remarkably cheerful in the photo! Big hugs to all of you. Glad to hear you are recovery, but sad to hear about Adam. Sending prayers to him and his family for a speedy recovery without any complications. Your cards are adorable. Oh my goodness, what a scary accident for Adam. Praying for him and I hope he makes a swift recovery, Darnell. I am glad your recovery is going smoothly. Sending prayers for Adam for a quick recovery. This kind of accident could happen to just about any kid. Oh my goodness! What a scary situation for all involved. I hope Adam has a full and complete recovery. Thank you for sharing an important lesson. Something we don't tend to think of right off the bat. Relieved to hear you are doing well. Your cards are fun. I was wondering what the "stamp" was at first. I think you chose a very clever two.fer. Thanks for clarifying and always love your fabulous humor! Please take care and know that I'll be thinking of you all as you and Adam recover. Hugs! It's good news to hear your recovery is going well. So sad to hear about Adam. What a scare that must have been for everyone. I'm sending prayers for a smooth recovery. Love your cute cards. I have the geometric dies and love your inspiration about how to use them. Wishing you and Adam all the best. I am so glad your grandson is going to be ok. How frightening. Just another teeny bit and it could have been a different story. So glad God had him in His hands. Now just get better yourself and you all stay safe out there! Praying for all of you. A similar thing happened to another friend's grandson 5 or so years ago when he was around the twins' age and he has no effects of it now. I pray the same for Adam. Love the geometric cards - and am especially fond of the chickadees! Cute faces and feet I might add :) Great cards and thanks for another fun Twofer challenge. Now please take care of #1 and #2 in the meantime! So sorry you're both going through turbulent times so I'm sending healing hugs your way!! First off, I am glad your surgery went well and here you are back at making gorgeous cards! Secondly, oh my gosh... poor Adam and I do hope he makes a full and speedy recovery! Your cards are terrific of course. I have the SSS die and must dig that out and use it. I've never thought to add the cut away pieces of the die to a card but I like this much better than the way I used it. Love those chicks. I've had that set for ages and never, ever used it but you've inspired me to dig it out and put some ink on it. Oh my goodness! I hope Adam heals quickly. So glad you are recovering well. Love your cards fun and adorable! I'm so happy to hear you are doing well. Seeing that picture of Adam really brings home the reality of what can happen diving into unknown waters. I am praying for his recovery and broken bones to heal without intervention. I love your geometric cards. The blue and white is striking and the chickadee is adorable. Love his Santa hat! FABULOUS cards Darnell...will definitely have to go looking through my dies and stamps for this challenge!! Glad to hear you are healing too, but oh my...poor Adam! I hope everything heals correctly and he's back on his feet in no time! I will definitely be sending lots of prayers for him and ALL of you! Your family really has been hit hard this year, and I hope this is the end of it for all of you!! Take care and hang in there! Hugs!! So, so good to hear that you are mending well, I hope it continues so. I could not guess which die you used on both cards, you are so very clever to see what you did - the cards are fabulous!! First, and most urgently, I am so glad Adam is getting the care he needs. You can be sure he'll get the most positive healing thoughts from me and the prayers that his injuries knit together successfully. Kids can scare the hell out of parents and this one caused a few grey hairs to appear, I'll bet. Secondly, your cards this time are so diverse. Love the sweet hugs card but I'm totally blown away by the Christmas card. Making "Santa" so tall seems appropriate but it took me a while to figure the twofer correlation. Dayang girl, you are cleverer than even I thought. Happy to hear your healing well...still sending good vibes. Glad your surgery went well and you are on the mend. So sorry to hear about Adam's diving accident. Will certainly keep him and the family in my prayers for a speedy recovery. Thankful it was not more serious or permanent. The news about my grandson surprised me very much. He is lucky that he has not suffered a spinal cord injury. Of course I will support you with prayer and good energy. I also keep my fingers crossed so that everything comes to a full recovery. I can not believe that this is another challenge for the twofer ... I did not manage to make the cards for the previous challenge, and you are already changing the theme of the challenge :-( Is this the only way I get away with this time? Sending prayers for Adam, positive thoughts for a quick recovery. Fabulous cards and great ideas for the die. First the important things: Glad you are getting better so good! And tjee there must have been an angel with adam to get him to come out this good! (friend of us is paralised through such a dive) Sending some positive energy to help him to heal. Hope it will work! Good to hear your recovery is going well but sad to hear about your grandson. Kids are tough and thin it won't happen to me - sending prayers for complete recovery. Love both of your cards - but the first one is my favorite - especially since Hammy helped. Love how you made the die work for your twofer. Great job. Prayers and a speedy recovery to Adam and all the family! You have had too much for this year so no third issue ok? I am glad you are doing better and that your grandson is recuperating. That is scary and I pray his back will heal and no surgeries will be required. Funny, I am on vacation on the Richelieu River and we talked about 3 people who dove and hurt themselves but none had to go to the hospital which they are very lucky. I love your cards and was wondering how they worked together...very creative and inventive! I love the birdie card which is funny. The other card is peaceful and elegant with that blue. Two lovely cards Darnell..pleased to hear you are progressing nicely....so sorry to hear about Adam’s accident...I will pray that he doesn’t have to have an operation....sending you and all your family lots of love and I’ll think of you all in my prayers ..
Hi Darnell, So glad your op went well and you are recovering. So glad Adam wasn't permanently affected by the diving accident. Sending him heaps of positive healing thoughts. Oh, your sweet Adam! Truly, it could have been so much worse, but plenty scary and worrisome as it is. He's enveloped in love and prayers and well wishes, and youth is on his side, so hoping for a quick and seamless recovery. And you, too! Now, your cards... Pretty on one side, cute on the other! Cleverness abounds in everything you do. Love that fun foam Santa hat and the long-legged chicks, and the blue card is sooooo pretty! Perfect, really. Take care, Darnell, and gentle hugs to Adam. My sincerest prayers and hugs to Adam for continued healing! What a scare, Darnell! I seriously gasped when I saw his photo, then read your post...Thank you for the additional advice/reminder, especially for our youngins' :) I'm so happy that you are progressing, as well...great big hugs coming your way, my friend! 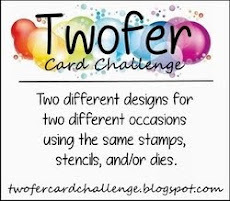 Your cards are fabulous for the Twofer Challenge! I love the clever way you played with the die...it works so well with your 'Chickadees' and your design is really cute! Love how you added Washi to your other card, too...very pretty, indeed! Graphic images are so much fun, and I can't wait to play along!!! OMG Darnell, you must have been out of your mind with worry. I'm so glad he's going to be OK. Luckily Kids do bounce back fast than us old uns, but having said that he is one lucky boy getting to hospital so fast. First and foremost, thank God that Adam will recover and be more careful the next time! How scary and how blessed, although I'm sure there are times he doesn't think so. And I'm glad your recovery is going smoothly. Oh goodness, how scary for Adam...for all of you. Everyone is in my prayers Darnell. I'm happy to hear your recovery is going well and I hope Adam's does too. On a happier note, your cards are terrific. Love that fun Santa chick! Sorry but most important things first, just went cold and shivery, thank goodness the lovely boy did not do any permanent damage and I wish him a very speedy recovery even though it could take some time the young have a lot better chance of that. Your cards are fabulous and a great use of the die, your idea for the second cards is nothing but brilliant. Wow, that had to be scary for all especially Adam. Sending along prayers and well wishes for a speedy uncomplicated recovery and healing for Adam. YOur cards are fabulous, I really love the straight and round Santa bird along with the squirrel-Ly birds. It made me laugh. Your card in blue is lovely as well. Hopefully I can get in on this challenge. I missed your last post, so hadn't realised you need another op. Hope your recovery is going well. Wishing Adam a speedy recovery too, it must have been a scary time for all the family. Oh my!! Poor Adam, he really has had a unlucky vacation! But he is so lucky to be in good care and having no serious damages! Sending my best wishes for his speedy recovery!!! So glad instead for your good health post surgery, even if surely you have been so stressed by Adam's accident!! Beautiful cards as samples, so different! One so fun, the other very elegant! Well done with your dies! Wonderful Twofers. Great way to use that die two very different ways. How scared for all with Adams accident. I hope he heals fast and I will keep him in my prayers. So pleased that your surgery went OK and that you are well on the mend Darnell, but what a dreadful thing to happen to Adam, and as you say it could have been a whole lot worse. He is young and so more likely that the neck surgery will not be necessary, but send you and the family all my very best wishes and you will all be in my thoughts. Your cards are so clever and the bird was such a great and fun use of that die and the other sweet birds coordinate so well, and then your blue card with the die used as a border to go with that pretty washi tape and butterfly, and a super die cut sentiment too. Your cards are so creative again! Love how your mind works! I am so relieved that Adam's accident didn't have a worse ending and will pray for a quick and complete recovery for him as well as for you, my friend! Hope your family gets a break soon from all these health troubles! Your cards are awesome, as usual. 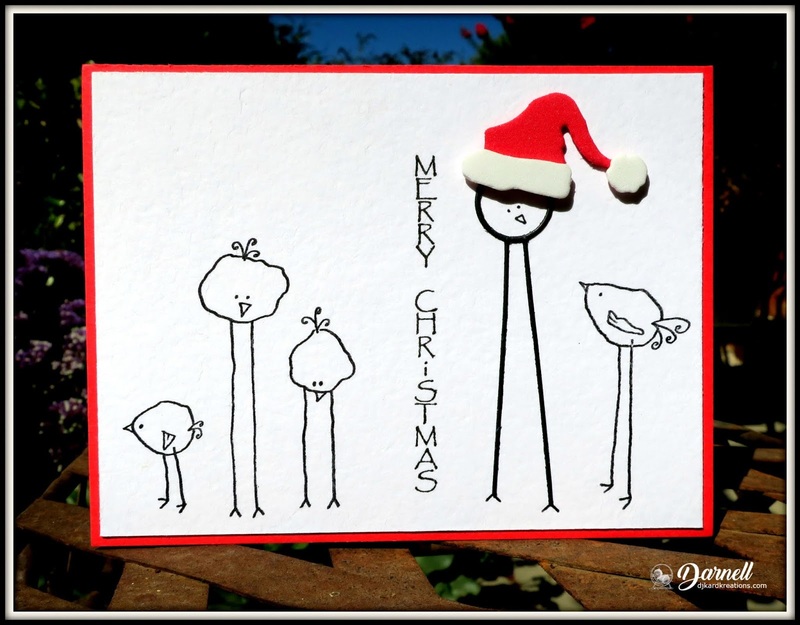 I especially love that long-legged Christmas chick. I used to be a long-legged Christmas chick, myself!! I'm so very sorry that your grandson was injured so seriously. I will definitely send him my best healing vibes. It's wonderful that he has such a supportive family - 'specially his grandma!!! Another two creative twofers, Darnell. The chickadee Santa is quirky and cute. Love it! What a very scary thing to happen to Adam! Sending him my very best wishes. And so glad your surgery went well and you are recuperating. Love the way you used circles on your two cards - such fun cards! It's great to see Adam in such good spirits. Such a scary accident and I'm thankful that he was able to be transferred to Seattle right away for treatment. That six weeks is going to be a long haul. Sending prayers and healing thoughts to Adam, and to you Dolly! You have to take it easy and recover from your surgery. Thinking of Kevin too as he's had a lot on his plate. Good to hear you are 'on the mend following your surgery! Oh my where to start? Firstly I am sooo happy to hear that you are doing well and on the road to recovery... I pray that you will go from strength to strength and no more surgery will be needed EVER! Then your grandson ... Wow! I am sending heaps of positive thoughts to all of you and thank the Lord that he didn't do worse damge...I truly hope he's up and about again in no time but it must be a terrible worry not to mention shock for you all! On to your cards! Brilliant is what comes to mind... Very clever and great cards too! 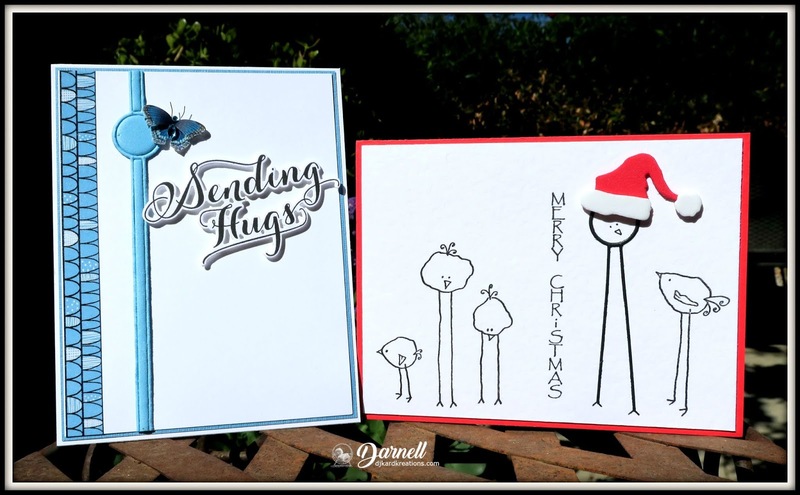 Two super fabulous card Darnell! I love the little chickadees of course. I'm so glad to hear you're doing ok. Surgery is never fun and I'm thinking you've had your share of them now for a while. Hope you continue to recover nicely. And poor little Adam! What a lucky young man he is. Hope he recovers completely from this diving ordeal. Not a good way to end a summer camp for sure. Hugs to him and to you! Oh my goodness -- what a scare. Sending thoughts and prayers to you and your family! Darling twofer with the circle, Darnell! Glad you're doing well & sorry to hear about Adam's accident. Happy healing to both of you!! Good to the hear Adam should be OK. Fingers crossed. Fab cards. I must point out I come to visit just as much for your words as your cards! 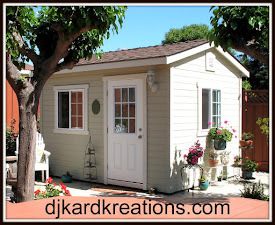 Lovely CAS designs Darnell, fun too! Unlike your grandson's accident, quite a nasty one, I do hope he recovers fully. Hugs. Your cards are great, Darnell. Oh my gosh - how scary!! I wish him the very best and hope that everything will heal up perfectly. Oh my gosh Darnell! How scary that must have been to hear of your grandson's accident!! I'm SO glad he's recovering! Sending prayers that he recovers and heals quickly! Love both of your cards! Never would've thought to use the die that way to make a bird!! So fun! Hugs to you!!!!! My jaw dropped when I saw the photo of Adam! I told my family about it and a unified GASP filled the room! Praying for you, him, and the family! Your twofer cards are both so clever! Of course that bird is adorably clever with his long legs and Santa hat, but I say your blue card is clever because you used washi tape intentionally and it looks gorgeous! My washi tape only gets used as an afterthought. So glad you are on the mend Darnell...take things easy and recover x My thoughts and prayers are coming your way with the awful and scary news about Adam...You must have been worried sick to hear the news ? Struggled at first to see the same die or stamp on your cards. You are a genius ...So clever, such fun and so creative. Yes I am imagining the chat on your Christmas card between the chicks, dazed Dad and Santa x. So lucky that that cute butterfly flew in right on cue....LOL ....on your second gorgeous card. P.S. Loved both your cards. Sweet geometric cards Sis - I haven't been able to get my head around this challenge yet - maybe it will percolate up before the deadline??!!! I love your creative geometric cards, Darnell and am so thankful to hear you are healing well from your surgery. Continued prayers for Adam and family, so sorry to hear about his injury, but also so thankful it wasn't worse. Hugs! Oh my gosh! I am so sorry to read this post I didn't even see a card. I am sorry... but thank God Adam will be ok. You all must have been worried sick. What a bad friend I am....please forgive me. I will be praying for a painful and speedy recovery and also thanking God . Glad to hear you're on the mend hun and I hope that Adam is doing well after the accident .... sending huge hugs. Oh my goodness--how scarey! Such an awful accident that as you say, could have been disasterous & I'm so glad he's recovering! Wonderful his brother could still enjoy camp--maybe we can learn from kids!? Will certainly be sending lots of positive thoughts to all of you! I think you guys are due for a medical-free year--haha! I have that set of dies & never seem to be able to use them successfully. You, however, have made 2 brilliant cards, my friend! And now I know. I will definitely put Adam on my prayer list which is growing by leaps and bounds. Hopefully his young age will be in his healing favor. I'm not sure I totally understood that die you used for your cards but I sure like the results. Those chickadees are some of my favorites and to think they were visited by Santa warms my heart. Wow Darnell what a shocker that must have been, poor bugger. Good to see the thumbs up sign there, he looks like he is taking it all in without too much fuss. Bet that got the ticker turning over in a rush, family. What a year. Lots and lots of positive thoughts and vibes coming your way though a bit late but better late than never. Hello Darnell! So good to know that your surgery went well and you are recovering without problems. I'm so sorry to hear about Adam's accident! Fortunately he is strong and optimistic and has a great loving family. I'll be praying for a full speedy recovery. 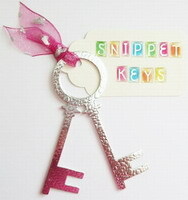 Cute cards, just love what you did with that die :).